“I’m a purist. 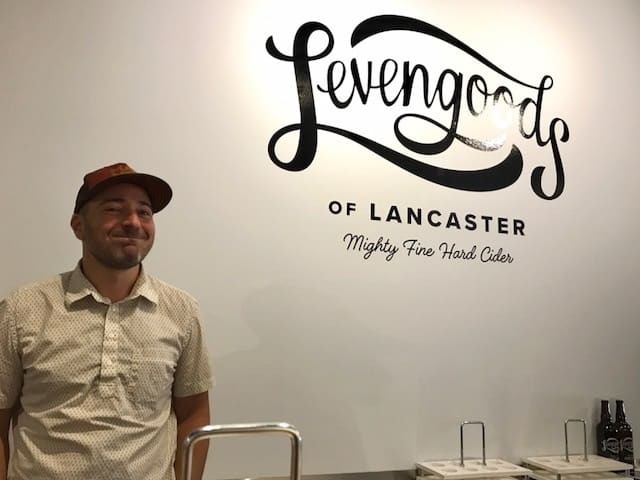 I want my coffee to taste like coffee and I like my cider to taste like apples,” said Lane Levengood, owner of Levengoods of Lancaster. 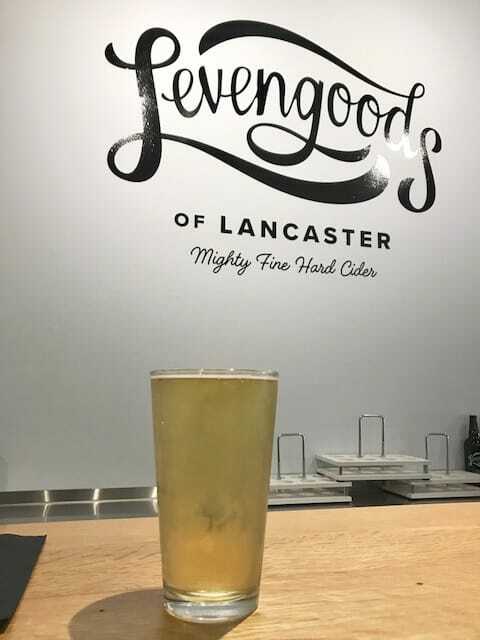 “We are happy to bring cider to the city of Lancaster,” Levengood continued, as he smiled at me from across the wooden bar and welcomed customers to the city’s first hard cider tasting room. 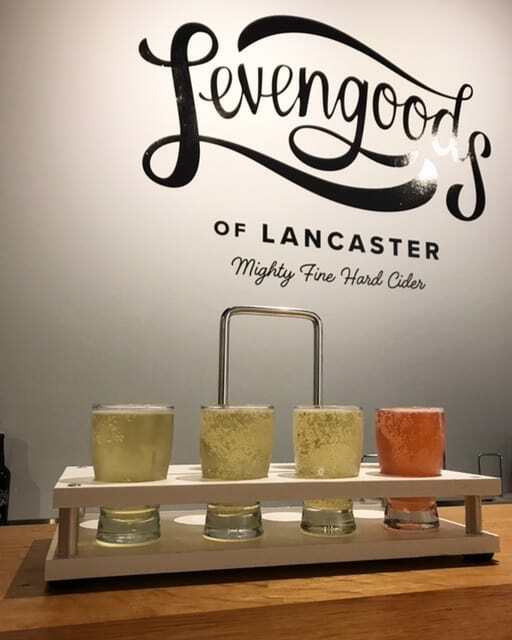 The brand, located in downtown Lancaster at 104 W. King St. (the former home of Sunshine Art+Design Studio), opened its doors to its fresh and efficient 1,350-square-foot space very naturally—it didn’t want too much hype surrounding the opening of the cidery. So, it quietly opened to the public on Wednesday, July 26, after two nights of soft openings with friends and family. About 35 seats await eager cider drinkers to relax in the space outfitted with a bar, tables and a lounge area. The room’s personality is rounded out with white walls, natural wood and navy blue accents, CAD drawings on the wall and an overturned canoe suspended from the ceiling. Lane is not new to owning a business. As the previous founder and owner of Square One Coffee, he got into cider as a hobby. After working at a local brewery and distillery, he was happy with his homemade cider and decided to go pro. He sources his juice from Lancaster County’s Kauffman’s Fruit Farm & Market and currently has four styles of ciders on tap: dry, original, sweet and cherry, which is a seasonal that will swap out for peach soon. His go-to cider for sipping is a dry cider, and in his circle of (mostly) beer-drinking friends, he’s found that a drier cider is preferred. “I do not like hopped cider,” he confirmed. “I’m not saying I won’t make a hopped cider in the future, but it’s just not my preference to drink. I do love a barrel-aged cider, though,” he confessed, as evidenced by the barrels tucked neatly beside the fermentation tanks in the back. Barrel-aged cider is something he’s currently experimenting with. 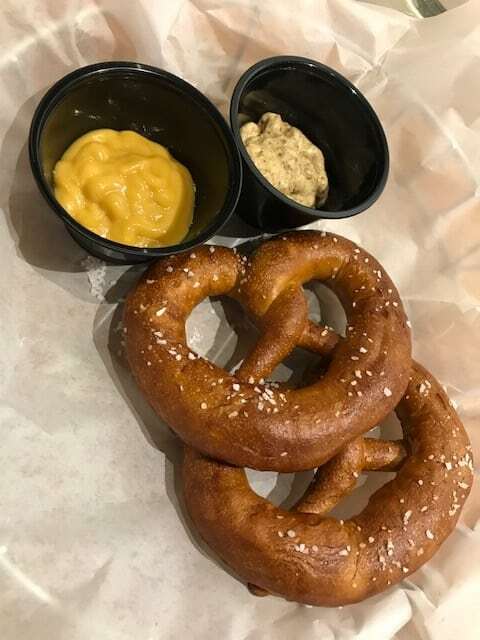 The small menu offers a variety of snacks made in-house and sourced with local ingredients, like nachos (Mexicali, buffalo chicken, Asian pork and Irish pub) and soft pretzels sourced from York City Pretzel Company with an array of dipping sauces. Flights of 5-oz. pours are available for $2 a serving and pints of cider are available for $5.50–$6. Currently, the only bottles for sale ($8) are original cider, but that will expand. All house ciders are 6.5 ABV. Local wines and PA beers are also available, including Funk, St. Boniface, Mad Chef and Spring House. In addition to the local ingredients, Lane keeps other parts of the tasting room local, too. He made his own flight trays and sourced local talent to help with design. Laura Korzon of Paper Jane designed the smart logo. Local ideas are also valued. Employee Rob Tarves serves up pints with a smile and all food with a spork. “My mom said she felt that she needed a spoon for the sauces, but then she also needed a fork for ‘all the crumbly bumblebees you still need to pick up,’ so we decided to avoid having two utensils and just get sporks,” said Rob. For now, these ciders are only available on King Street. “Yup, for now our ciders are only available at Levengoods. So come on in here and drink,” Lane laughed. Find Levengoods of Lancaster at 104 W. King St., Lancaster; phone: (717) 220- 3595.